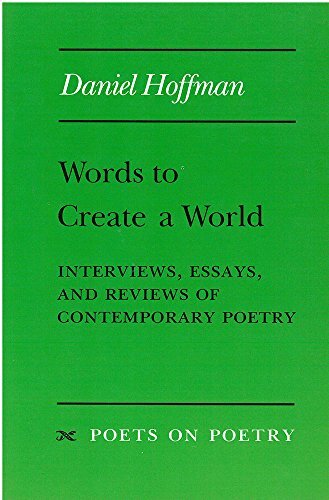 Words to Create a World collects interviews, essays, and reviews by distinguished poet, critic, and literary historian Daniel Hoffman. The book begins with the text of his inaugural address as Consultant in Poetry for the Library of Congress, in which Hoffman examines the stylistic revolution that signaled the birth of modernism. The final essay, “Wings of a Phoenix?”, examines the possibilities for poetry in this postmodern era. Between these are discussions of books by and about founding modernists (Pound, Moore, Sitwell, Frost, Graves, Auden) who do not “succumb to the imitative fallacy and gibber at the window because the house is on fire.” Hoffman’s historical imagination elucidates the work of many other contemporary American and British poets, including his own. Words to Create a World will appeal to the reader who enjoys poetry and who hopes for guidance over the sprawling terrain of verse in the twentieth century.